This beautiful columnar Birch tree has vibrant golden yellow leaves that don’t scorch in strong sun, unlike many Golden Birch varieties. Betula pendula ‘Golden Obelisk’ has pretty silver-white exfoliating bark, similar in appearance to other Silver Birch trees. Betula pendula ‘Golden Obelisk’ is a fantastic tree for adding colour to small gardens, whether in strong sun or dappled shade. Expect this Golden Birch to reach 6 x 3 metres in 20 years. Our pot grown Upright Golden Birch trees can be planted at any time of the year. Start by removing weeds and grass within a metre of your desired planting hole. Dig a square hole as deep as your root mass and approximately 2x as wide. To help the tree establish more effectively, sprinkle root grow in the hole. Remove the pot, gently loosen the roots and place into the planting hole. Mix 50% of the original soil with 50% compost, fill in the hole and firm around gently. Avoid banking the soil up around the collar of the tree. We recommend planting Golden Birch trees with a stake and tie kit to ensure the roots are well anchored - instructions are in the planting guide. If you're planting Golden Birch in spring or summer, water well for the first few months. Increase watering if there are extended periods of hot or dry weather. If planting in autumn, you may only need to water a little. Unlike other species, Birch trees would rather be in wet soil than dry. Irrigation kits make it easier. Once planted, keep the area free of competing weeds and grass for the first couple of growing seasons. If your area is prone to rabbits, use a rabbit guard. To keep the silver bark on this Birch looking its best, you can wash algae off using a garden hose or a sponge with slightly soapy water. Established Upright Golden Birch trees do not require pruning and do not take well to hard pruning. 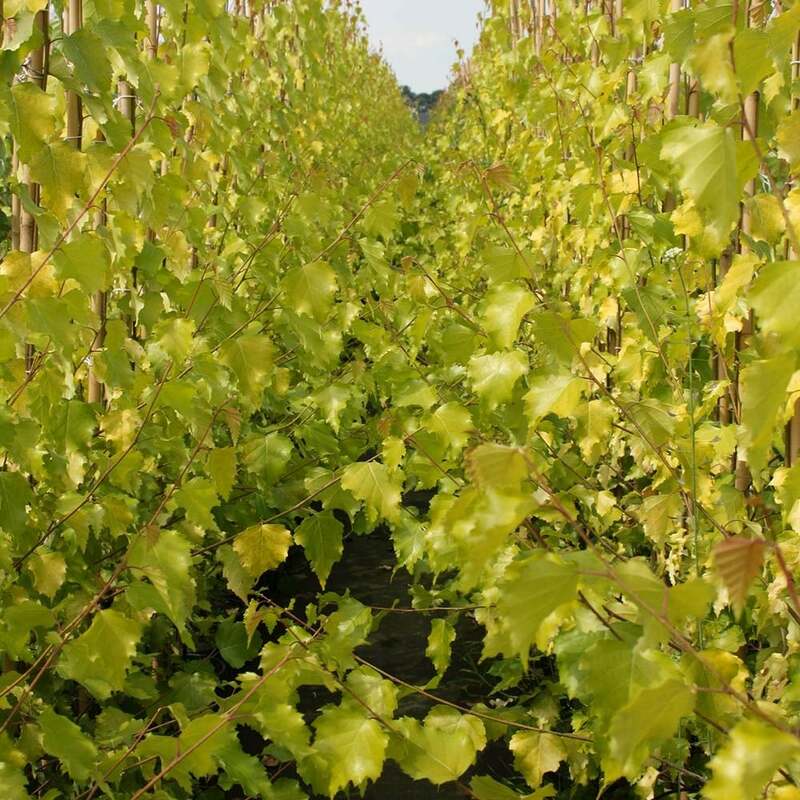 Hard pruning increases light penetration which in turn results in increased soil temperature and decreased moisture levels. Simply remove the lateral shoots to maintain a clear trunk and prune any diseased or damaged branches in late summer to mid-winter. Golden Birch trees bleed heavily at all other times of the year, especially late winter.